In the morning, we had a private charter 3/4 day trip. We left the dock under cloudy, windy skies as a front moved through. We took a 2-3 foot sea out of the Northwest all the way to the fishing grounds. The first stop was a bit windy and the tide was screaming aft, but really it was a surface current, after 15 feet, everything went straight down. The bite was good for the first 2 stops. During the second stop, the wind died out, the sun came out and the bite faded. By the end of the trip, it was flat calm, bright sunshine and warm. The surface current had a big impact on our landings of legal fish and we also got inundated with those pesky cod fish (“Oh no, it’s another cod”), up to 12 lbs. Keepers included haddock, pollock, cusk, redfish, and mackerel. Not as many keepers as we like, but plenty of fishing action. The afternoon 1/2 day trip was absolutely beautiful, weather wise. The fish were waiting for us, just not willing to bite. The calm conditions of the ocean certainly negatively impacted out catch. A few haddock, redfish and mackerel were included in the keepers. I am sure there will be better days ahead as we settle into the summer warmth. The morning started with a cool chill, but very calm conditions with light winds 5-10 knts. It was overcast most of the morning with a slight 1 foot ripple on the ocean. The current was not nearly as bad as yesterday. The first stop was a pick, we had a few keepers in the mix of cod and shorts. We made a slight move up the bank and it got much better. I forgot how much I love the 3/4 day fishing grounds because of the variety of fish we catch. The second stop produced, keeper haddock, redfish, cusk, pollock, and some jumbo mackerel. After the bite petered out, we made one more move and got some of our largest haddock of the season. A 9 lb cusk won the pool, everybody left with fish and smiles. We came within a few haddock of our limit which is fantastic for a short 3/4 day trip. Really, a very fun trip. The afternoon 1/2 day trip suffered from nice weather. We had a boat with enthusiastic kids, too bad the dog fish are not in yet, these guys would have loved that! Instead they got a few short fish and a few keepers. We tried a different 1/2 day spot today that has produced for us in the past, too bad it didn’t work out today, even with all the markings on the fish finder, it’s fishing. Talking to the kids, sounds like they had a great time, of course the adventure of an outing like deep sea fishing will create memories with or without the fish cooperating. We are getting into our busy season at the Gloucester Fleet with many evening cruises, all day fishing, partial day trips. The boat has never looked better, we put a great deal of money toward a cosmetic upgrade. We have a little more work to do, but we are also making an investment into our rental equipment to try to improve our customer’s experience board the Lady Sea. Trips are starting to book up fast on weekends. Remember, we only put 40 people on the boat. Call us at 978 559 1978 to make your reservation. Ran our first open boat 3/4 day trip of the year and crushed them. We came within 10 fish of our haddock limit, we caught red fish, pollock, mackerel, and a pool winning cusk of 8 lbs. It was only a 2 stop trip, first stop, we picked away, the second stop there were fish coming over the rail at a constant pace and we stayed there for the duration of the trip. The weather was good, 2-4 ft seas freshened by a northerly breeze that kept the ‘hoodies’ on for the entire trip. In the afternoon, we ran our first 1/2 day trip of the year. The weather was great, the skies cleared, t-shirts were easily acceptable. It was consistent fishing and catching with haddock, pollock and a few cod in the mix. A very good half day trip. So far this year, we have had very good fishing on every trip. There are a lot of fish around, most people leave the boat with fish, and the adventure of sailing out of Gloucester is special in it’s own right. The dog fish have not been a problem yet, come fishing, get some fresh haddock….it’s worth the trip. We had a full day charter aboard today. The fishing and catching was very good. We easily made the bag limit on haddock with a couple cusk and pollock mixed in, made it a great day. There was life again on Tillies with a few whales meandering about the balls of bait. Calm sailing, good times. Early start to the day for us. In a thick haze/fog, we sailed out to Tillies on our first marathon of the year. It was a clam ride with visibility ranging from a quarter mile to a half mile most of the way to the fishing grounds. The marathon gives us extra time to explore different parts of the fishing grounds. It started as a slow pick of haddock in the morning. After a mid morning tide change, the bite picked up and we made our haddock limit. There was also a nice sign of pollock arriving, with a 7 lb pollock taking the pool today. There were more nice signs of bait, herring and mackeral. The wind piped up from the south making for a bit uncomfortable ride. The forecast for today called for strong southerly winds, 4 to 6 foot seas, with rain and thunder. With a light reservation list, we decided to take today off. We could have sailed, but the misery to endure just wasn’t worth it this early in the season. Looks like we will have some inclement weather for the first half of the week, should mix things up a little. Next weekend, we start our 3/4 day and 1/2 day weekend schedule. The fishing has been very good this year with almost everybody leaving the boat with fresh fillets. Another nice day aboard the Lady Sea. Feels like summer is here, at least on land, still need a sweatshirt on the ocean. a little bumpy again this morning with another nice ride home. Weather at the dock was warm, we felt it coming through the breakwater. The fishing was good, catching was a little slower than it has been. The haddock were there, but the bite was a little slow. The whales from yesterday were nowhere to be found today and the amount of bait on the ledge seem to have dispersed. Fishing is strange like that, we left them biting yesterday, went back today and they just were not as interested. Most people had fish walking off the boat and better days ahead. Some cosmetic maintenance this week, trips scheduled at the end of the week, forecast looks great summer like 80’s and calm. A little bumpy out of the gate, brisk SW wind hit us on the keel making it a bit uncomfortable for some. As the day passed, the wind quit, the chop settled down and we had a nice ride home. The whales are on Tillies, we saw plenty of spouts and a few fins break the surface. The fishing was very good all day. The first couple spots a bit north of where we had been fishing produced some great cod, we hauled anchor and moved south. We picked away at the haddock all day, just as the haddock bite took hold, the cod would reappear, so we would haul and move. Overall, it was a great day, just shy of our limit, a couple dogfish and a wolf fish visited the deck and were returned to the ocean in short order. Monday, Memorial Day, leaving at 7am, still a few spots available. Our first marathon of the year, we waited and waited for the wind to subside, but at 5 am the NW wind was a steady 20+ knots with gusts in excess of 30, it would have been a challenge to safely get the boat off the dock and the cut bridge to Gloucester harbor would have been sketchy at best. After much debate, we decided to stay tied to the dock, just not worth risking the safety of our customers and crew. We apologize to them, but 12 hours of getting beat up by the ocean just didn’t make sense today. Better days ahead. We still have room Monday…..
Fabulous Friday. Lots of smiles walking off the boat today. Boat limit on haddock, a few cusk mixed in. Lots of fun with a few good size cod caught and released. The weather was great for a comfortable day of fishing and catching. We have a full boat Sunday, but plenty of room still available for Monday, Memorial Day. Spring fishing at it’s finest, whales and other sea creatures still in the neighbor hood. 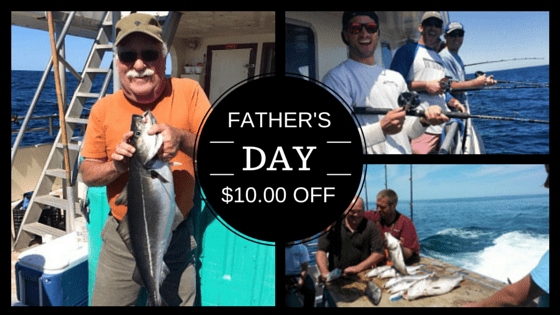 Make it a combo fishing and the possibility of seeing whales, no promises either way, but a great opportunity to get out on the ocean. Perfect. The newly painted Lady Sea made its first exit of the year bound for the fishing grounds under sunny skies, zero wind, and an eager group of regular Lady Sea anglers. On the ride we came across fin back whales, dolphins and basking sharks. The ocean was flat calm, so viewing of these bonus sights was fantastic. On the fishing grounds we found plenty of bait and plenty of fish. The anchor never hit the water, with zero wind, drift fishing was the only option. It was a constant pick throughout the day topping off our haddock limit on the final stop. A couple Pollock and cusk mixed in made the day great for everyone aboard. The first wolf fish and dogfish of the year entertained the younger crowd on board. Our first charter of the year ran a trip to our ¾ day grounds. An eager group of school kids and chaperones visiting the Lady Sea for the 3rd year in a row. Again, the weather was good. The fishing was good with a mixed bag of haddock, cusk and red fish. For this group, it is always about the experience. Full boat Sunday. We left the dock in pea soup fog with visibility about 50 feet. We carried the fog all the way to the fishing grounds and most of the morning. By mid-day, the fog burned off, and we had a perfect ride home. Again, it was so calm, there was no use for the anchor and lines tended perfectly. The fishing was steady with mostly haddock followed by cusk and a random pollock. We came up a few fish shy of our haddock bag limit. We saw the basking sharks again, but no whales with the thick fog. 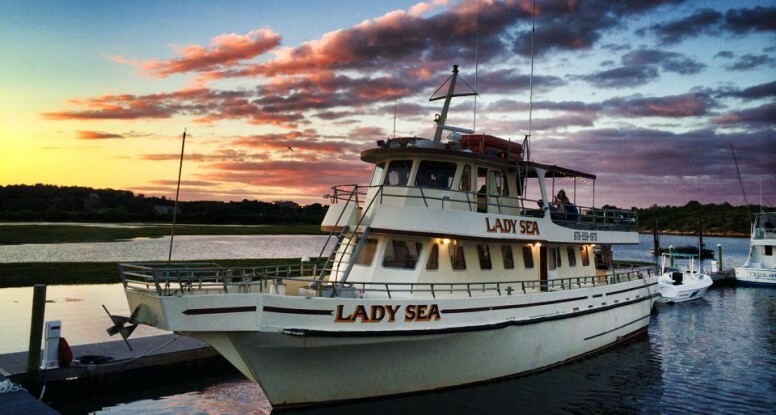 The crew of the Lady Sea could not have asked for a more perfect opening weekend. There are plenty of fish around, we think even with the new regulations, more people will walk off our boat with fresh filets than ever before. We have a little boat maintenance to do during the first half of the week, but we are right back at it this weekend and the long range forecast looks perfect. LOOK FOR OUR FIRST REPORT OF THE SEASON!